Anxiously awaiting the new TV season, Ellen and I have abandoned network and cable television and have been gorging ourselves on newly acquired season sets from the library. First up: Game of Thrones. With not being HBO subscribers, we are always a year behind everyone else we know in regards to these water cooler programs. I read A Game of Thrones five years ago; I always associate the book with Ellen’s pregnancy, because it’s the paperback I picked up when she and I did the “new parent” thing of going to the bookstore and buying EVERY GODDAMN PARENTING BOOK EVER WRITTEN in preparation for our new bundle of joy. I remember liking the first book in the series a lot, although I gradually lost interest in them as the story started wading more deeply into magical/fantastical waters. 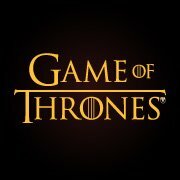 The HBO production of Game of Thrones was terrific, both as an adaptation and as appointment television. In particular, the producers ably met all the potential casting pitfalls so far. One of the challenges of making a Game of Thrones TV show is that even the characters who seem to have minor roles at first eventually, with the fullness of time, go on to become important player in the titular game. A character like The Hound has something like 10 lines over the course of 10 episodes… but he become far more important in future installments. Further, I think the casting of Sean Bean as Ned Stark was great. It’s not a flashy role, but getting an alum of The Lord of the Rings series in the lead role for this season was a brainstorm. All the baggage he carries with him from those movies make Ned Stark’s character arc in S.1 all the more surprising to viewers. Also, Peter Dinklage. C’mon. Awesome. If you’ve been reading over the summer, you may remember I took a run at reading Frank Herbert’s seminal sci-fi classic. I took a slow, leisurely… run. A jog, perhaps. I’m usually a quick reader, but something about Dune slowed me up; even though I was enjoying the book I didn’t get through it with my normal pace. I enjoyed the book enough to seek out the 1984 movie adaptation, famously directed by David Lynch. I’ve enjoyed the director’s work in the past – Twin Peaks was a fun ride for awhile, and Mulholland Falls was a flick a lot of my friends and I were crazy about. 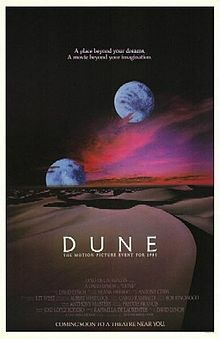 Lynch has famously disowned Dune and I was interested to see how the picture held up in that light. Boy, Dune is a fascinatingly bad movie. Elliot starts back at preschool in two weeks… and if I’m being honest, we are COUNTING THE DAYS ‘TIL HE’S OUT OF THE HOUSE. Henry’s going to be doing one day a week at the same school, and I think he’s really going to like it. I scratched this out during a meeting at school. Classic, right? 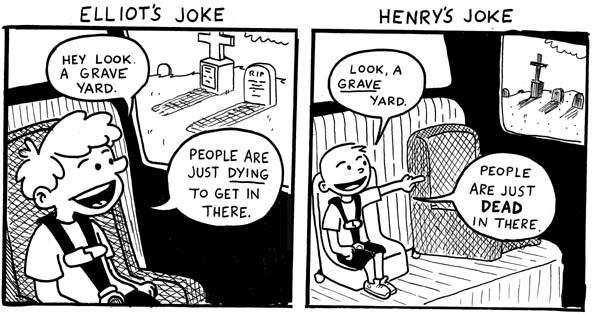 I believe Elliot picked this joke up from Arthur’s Halloween. Henry obviously picked it up from Elliot. I should start by letting you all know what I mentioned here has come to pass. I’ve been asked to teach seven periods of instruction this year, no planning period. I thought long and hard about whether I was going to agree to this request, knowing full well how important a planning period is to the general sanity of an educator. I also talked it over with Ellen for a few days, as I knew the burden of my working such a full schedule would impact her and the kids in a lot of ways. In the end, I agreed to give up my plan and teach a seventh class this year. The new class is an Honors English class for 9th graders, which is one of the chief reasons why I made the decision. Students in those classes tend to be self-motivated with good support systems at home already in place. I’m already teaching two other sections of Honors, so this wouldn’t be a matter of creating new lesson plans. I’d just have another section where I implement LPs I’m using earlier in the day. Although it’s a lot of extra work, especially at the end of the day, it seemed like a new class would be a decent fit. That being said, I do have some qualms about the choice I made. Besides the loss of downtime during my workday, I can’t help but think about the practical implications of this situation. If we have more students than teachers can adequately cover, the school should just be able to hire new teachers. That seems simple math to me. If you follow this line of thinking, I suppose I’m part of the problem. If I hadn’t volunteered to teach the class… and NOBODY else on staff had volunteered… well then, I suppose the school would have been forced to hire new teachers. At any rate, I said yes and I’m starting to wonder what my increased workload will mean for the comic. If the past week has been any indication, the time I usually use to sketch thumbnails (my planning period) has disappeared and the time I use to draw and ink the comics (after school, usually during the evenings) is reserved for rest and recovery. I have the first two weeks of comics planned for the 2012-2013 school year in my sketchbook… but I’m not moving at my usual pace. I suppose we’ll see what the future holds. 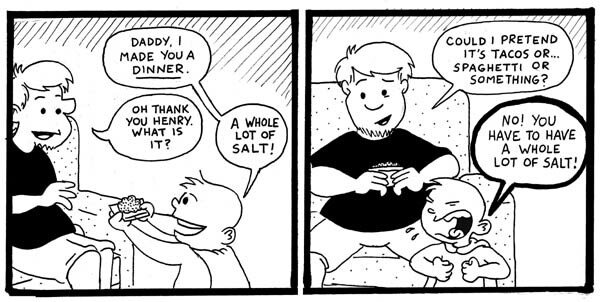 I have a couple of “Elliot and Henry” comics to post in the upcoming week. 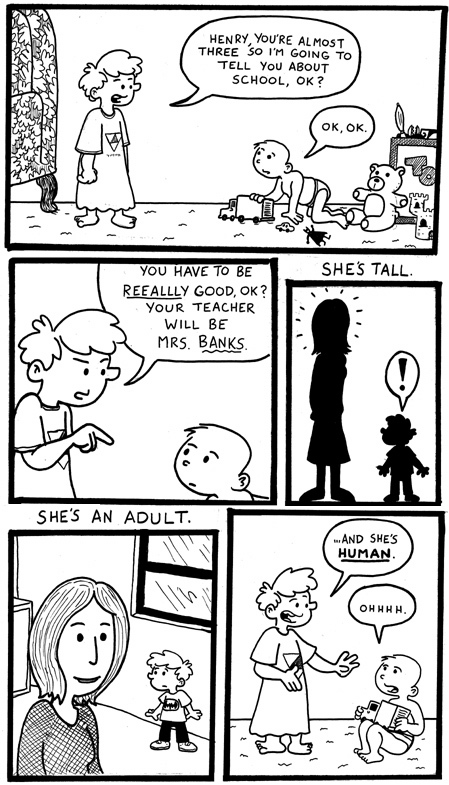 Hopefully I’ll adjust more to my new schedule and be set to post new teaching comics soon! Hey howdy folks, thought I’d check in with a quick update on what’s going on in the new school year. My classes started in earnest this week and on the whole, I have to say I have a terrific bunch of students this year. I’m going to miss the group from last year but I think I’ll enjoy working with the class of 2016 for the next few months. I should also mention my class of seniors, with whom I’m also looking forward to working. Our school is moving toward a new model for placing students in classes and it’s causes some initial kinks to the beginning of the year… specifically in regards to class size. No joke; I have a seventh period class of 40 students! FORTY! My classroom can’t even hold thirty desks! I’ve got kids sitting on the floor! It looks like I may be asked to give up my prep period and teach a full load of seven classes. I’m not sure what to think about this option. I would get paid 1/7th of my salary for the work, which would be nice. The new class would be an advanced English class; the possibility of working with motivated students make this a little easier to anticipate. On the other hand, I’m worried it would be like running a marathon every day for 185 days. I’m a little winded just from writing this update; imagine what seven nonstop periods of instruction will do to me. More updates as time allows. Twice a year, our local Target liquidates all the toys and games which aren’t big sellers. While in the past, most of the toys I’ve noticed on clearance have been well-deserving of being on the chop, this time around I couldn’t help but notice some darn fun action figures on offer. Combining this with both Elliot and Henry having become old enough to enjoy playing with these types of toys (well, mostly Henry if I’m being honest) was all the motivation I needed to buy some of this stuff. You are currently browsing the Teachable Moments blog archives for August, 2012.